So wrote David Studer, CBC’s Director of Journalistic Standards and Practices, in an email explaining why the news broadcaster will not be publishing offensive cartoons of Mohammed published by Charlie Hebdo, the magazine targeted by Islamists in Paris yesterday in a brutal attack that left 12 dead. Studer’s email, the CBC News report tells us, was simply a reminder of “CBC’s long-established policy” on publishing images offensive to religious believers. The meaning is clear: the CBC’s historical practice is to not publish images that could reasonably be deemed offensive to particular religious groups. Based on that declaration, we would expect that the CBC has never published images that would “dismay” Christians, right? Yeah, not really. 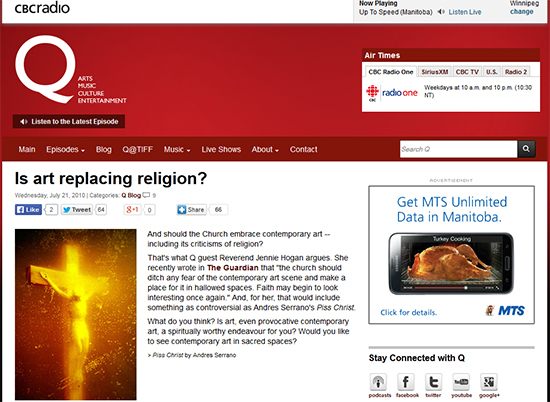 A quick search for Andres Serrano’s infamous “Piss Christ” shows up a couple of hits on CBC. In case you’re unaware of this “work of art,” it features a crucifix submerged in the artist’s urine. CBC screen grab taken January 8, 2015. 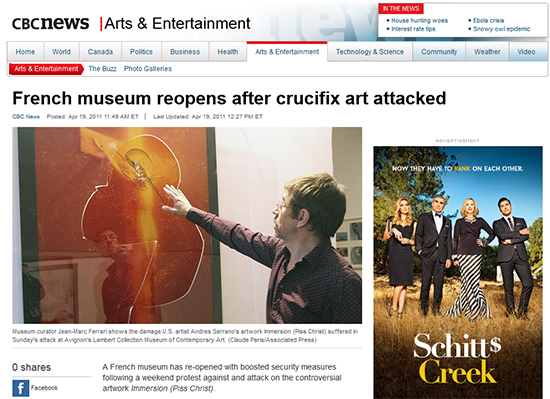 A year later, CBC published another image of “Piss Christ,” this time on its main news site (see here: http://www.cbc.ca/news/arts/french-museum-reopens-after-crucifix-art-attacked-1.1075952) . The news story in question? Someone offended by it had damaged the work. So apparently it’s okay to portray an image offensive to Christians when a member of that faith violently reacts to it. But not so much if the offended in question are Muslims. It might be consistent with their journalist practices when it comes to Islam but clearly it’s not when it comes to Christianity. Now, I’m not saying CBC should pull the “Piss Christ” images from its site. I certainly find them objectionable as a Christian, but I recognize we live in a country that allows freedom of speech. Instead, I’m simply pointing out a clear double-standard. Kudos to CBC’s Neil Macdonald for disagreeing publicly with the stance of his network. 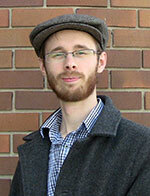 His report “Religion, Satire and where we draw the line” clearly spells out the difference in action. 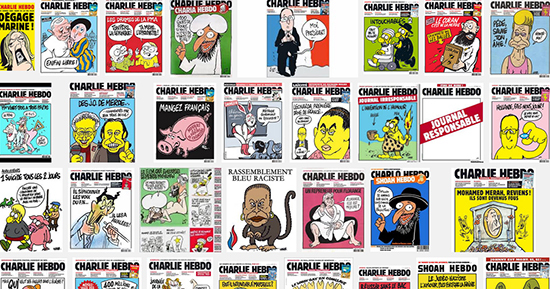 He was not allowed to show the Charlie Hebdo cartoons of Mohammed. But a Charlie Hebdo cartoon of Christ? Apparently that’s just fine. CBC can say it’s simply respecting its historic practice of not publishing images offensive to members of religious groups. But when we actually examine those historic practices for ourselves, we see it’s simply not the case. Captain Thin is powered by	WordPress 5.0.4 and delivered to you in 0.392 seconds using 37 queries.